What and when is St. George's Day? St Georges' Day is on 23 April. St George's Day is celebrated in England on 23 April, in honour of St George, the patron saint of England. 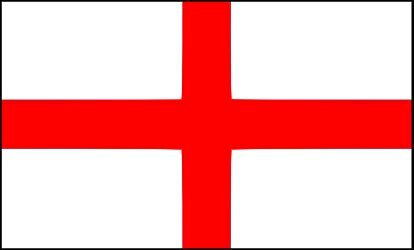 What does the flag of St George look like? Who was St St George? A story dating back to the 6th century tells that St George rescued a maiden by slaying a fearsome fire-breathing dragon. The Saint's name was shouted as a battle cry by English knights who fought beneath the red-cross banner of St George during the Hundred Years War (1338-1453). What is the national emblems of England? The flower has been adopted as Englands emblem since the time of the Wars of the Roses - civil wars (1455-1485) between the royal house of Lancaster (whose emblem was a red rose) and the royal house of York (whose emblem was a white rose). 23 April 1968: The first decimal coins — the five pence (5p) and ten pence (10p) — were introduced. 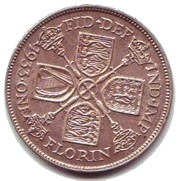 The five new pence and ten new pence coins were used alongside the shilling and the florin, and had the same value. They were also the same size and weight. 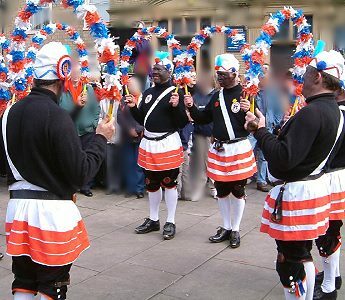 The Bacup Nutters Dance traditionally takes place on Easter Saturday in the small Pennine town of Bacup. Each year a team of folk-dancers with blackened faces dance through the town from boundary to boundary.